“54 hours is plenty of time to get my startup off the ground,” said no one ever. 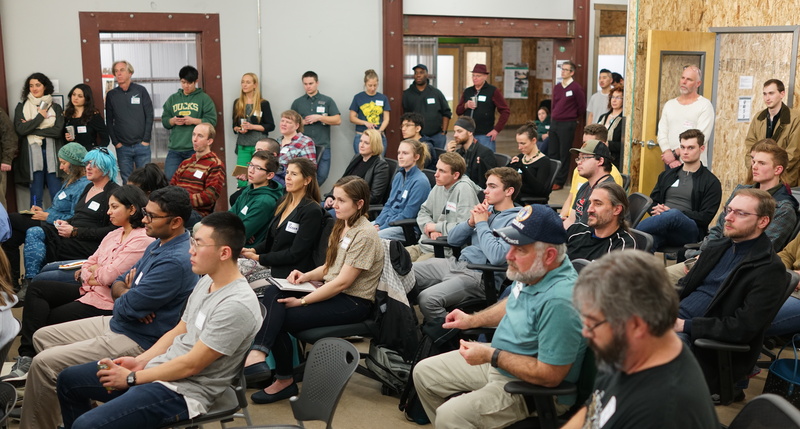 This weekend entrepreneurs, creatives, developers, and industry experts gathered at 942 Olive in downtown Eugene for Startup Weekend, a fun and interactive event aimed at doing just that. This year’s event kicked off last Friday evening, January 18, 2109. As participants gathered in anticipation to pitch, Michele and Steve Zimba, the founders of Nulia shared their story and took turns answering their most frequently asked questions about what it takes to launch a startup. Over 30 people lined up to pitch their new business idea in 60 seconds. Potential founders described innovative products, services, and platforms across a wide range of industries. After pitches, everyone was given the opportunity to vote for their top three favorite ideas, and the most popular were selected to continue. Participants formed teams around the selected ideas and quickly got to work discussing their strategy for the next two days. Teams focused on three main criteria: developing their business model, building a prototype or product (design, website, minimum viable product, etcetera), and getting customer validation. Shout out to this year’s mentors! These folks stuck around most of the weekend to make sure the teams were on track. They helped answer questions, shared resources, and removed obstacles for the startup teams throughout the weekend. Subject matter experts from a variety of expertise came in to meet with teams on Saturday to help answer questions and hone in their plan. Pitch coaches worked with teams on Sunday afternoon to help develop their messaging for the judges. Later that evening, each team had five minutes to present their startup to a panel of four judges and three minutes to answer questions. This year’s judging panel included Mike Biglan (Twenty Ideas), Brittany Quick Warner (Eugene Chamber of Commerce), Gregory Fortner (Beyond Limits), and Molly Rogers (Lola’s Fruit Shrub). Their decision could not have been an easy one, as all of the teams presented a compelling case. Ultimately they selected Closer to Home (third), Embrace.me (second), and Food Trucks Eugene (first), with Frontier Drinks taking this year’s crowd favorite. But, as anyone who has gone to Startup Weekend well knows, it’s really not about winning – that’s just icing on an already sweet cake. This year’s event volunteers and sponsors helped make this year’s event memorable for all of the right reasons. The organizing team volunteered quite a few hours to make it all happen. It was a treat to work with Kate Harmon, Elaine Pandolfi, Jeremy Green, Nam An, Emily Clyde, Vanessa Watkins, Sarah Vajgert, Elise Lockwood, Ariel Ruben, Terrie Monroe, Sean Johnson, Jocelyn Blore, and Corum Ketchum to plan and execute the event. These are the individuals and funding organizations responsible for making this event such an incredible experience. Our Techstars certified facilitator Josh Miller, who also happens to be my business partner and CEO of Mindbox Studios, told me that Startup Weekend events in Eugene “have the best food.” I don’t have much of a basis for comparison, but the mashed potato bar was a unique touch. So, aside from the obvious (the food), why do I spend time organizing Startup Weekend events? I have found it to be one of the best opportunities to bring together professional colleagues, personal mentors, new community members, long-time residents, and local industry/civic leaders to connect, share food, and sharpen their skills on the innovation process. You don’t have to be a startup founder to participate in Startup Weekend. Keep an eye out for announcements of future event dates in the Eugene area on Facebook, Twitter, or Instagram. What’s next for these founders? About 25% of Startup Weekend founders continue to develop their businesses after the weekend. For Eugene area founder, the id8 pre-accelerator is a great, free next step for founders who are looking for additional mentoring and support. For those who don’t continue with their Startup Weekend business, they will either found another startup or leverage their skills in our growing knowledge-worker economy. All of the photos in this piece were taken by Robert Scherle.